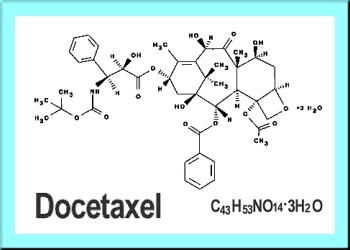 WASHINGTON, D.C. (FDA News) -- Taxotere (docetaxel) was approved today by the U.S. FDA for treatment---in combination with prednisone---of men with advanced metastatic prostate cancer. The Taxotere approval thus marks the first time in history that a treatment which prolongs life has gained FDA sanction for hormone-refractory prostate cancer. The approval was based largely on the results of a 1000-man clinical trial showing that Taxotere + prednisone extended life an average of 2.5 months longer than the control group treated with mitoxantrone + prednisone. Details of the pivotal prostate study, known as TAX 327, will be presented at a plenary session of the American Society for Clinical Oncology June 7, 2004 in New Orleans, LA. Taxotere has been approved in the U.S. since 1996, first to treat patients with locally advanced or metastatic breast cancer after failure of prior chemotherapy and later, for non-small-cell lung cancer. The drug works by inhibiting tubulin, which is a protein component of microtubules serving as the cell skeleton. Normally, microtubules are flexible constructions that play a crucial role in the dynamic process of cell division. For example, microtubules are the major constituents of the cellular apparatus known as the mitotic spindle, which helps to separate the chromosomes during cell mitosis. When taxoids attach to microtubules, they become extremely stable and static, making cell division impossible, thus killing the cells just as they begin to divide. The drug is typically given by intravenous infusion every 3 weeks. Adverse effects include hematological toxicity, particularly neutropenia, a maculopapular rash and other skin changes, predisposition to infections, and gastrointestinal affections. Adverse events may have increased frequency and severity in men with abnormal liver function. Taxotere is a member of the taxoid family and a semi-synthetic derivative of the yew plant. Taxol (paclitaxel), the first commercial taxoid, was discovered in the early 1970's as part of a National Cancer Institute screening of many species of higher plants for anticancer activity. Taxotere was brought to market by the French pharmaceutical firm Rhone-Poulenc, which was later acquired by Aventis Pharmaceuticals. Aventis will soon be acquired by Sanofi Synthelabo.